World Fine Art Professionals and their Key-Pieces, 95 – Lilian Wessels | Marbella Marbella – Adelante! I met Lilian Wessels at the exhibition ‘Ode to Beatrix’ in Gallery Haags. She showed me the sculpture that stood in the window. It just didn’t make it to the exhibition at Het Loo Palace. In this exhibition, on the occasion of the 75th of Queen Beatrix, national broadcaster NOS had made a call to make a work of art of a Royal Highness. That call got a massive result. No less than 2300 works were sent in, of which 75 were hung at the walls or stood at the floor of the Loo Palace. There was an initiative to organize an own exhibition with those who dropped out. There was much enthusiasm and ‘Ode to Beatrix’ travelled for a long time with a lot of success in various museums, exhibition halls and galleries across the country. 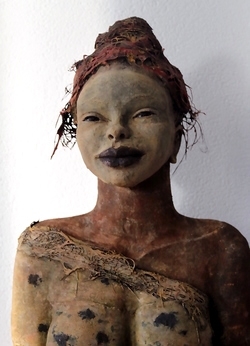 The sculpture Lilian showed me was standing in the window of Gallery Haags. “I put down the Queen as a human being, not stately or in a serious role, but as human between humans. My inspiration was her own sculpture ‘Jantje Beton’ (Johnny Concrete). Beatrix preaches solidarity, hence the title ‘Solidarity with Jantje’. At her iPhone Lilian quickly showed some other work. 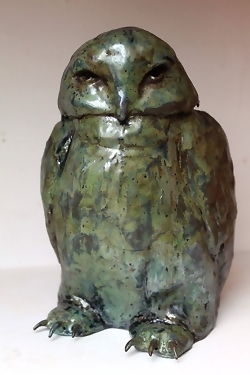 “I’m mostly inspired by the African woman and Tibetan Buddhism, but also owls fascinate me. As a young girl I already felt connected with Africa. 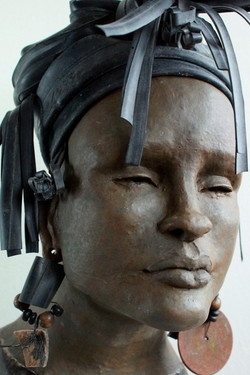 Especially Kenia, Tanzania, the beautiful scenery, the people, the tribes, all with their own rituals and traditions.” These influences are reflected in her imaginative statuettes. 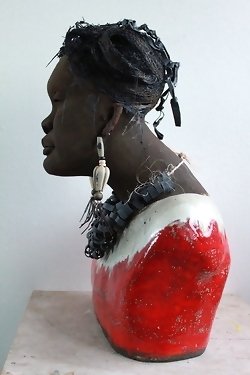 Lilian makes busts of ceramics that look gorgeous. Lilian: “To understand Africa you need to hear with new ears and see with new eyes. 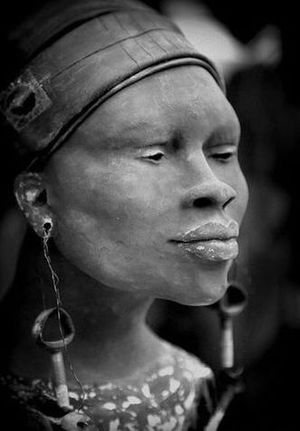 Is is a beautiful continent, where there is a lot of love, struggle and grief.” The sculptures radiate warmth and intimacy. But even ancient pilgrimage routes, prayer flags and monasteries fascinate Lilian. China and Tibet give her plenty of inspiration. 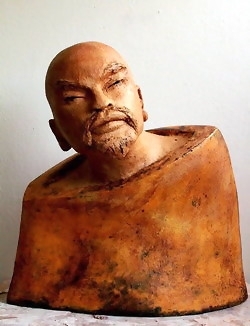 In her sculptures you see Chinese philosophers, pilgrims, monks and Buddhas, with their characteristic faces. 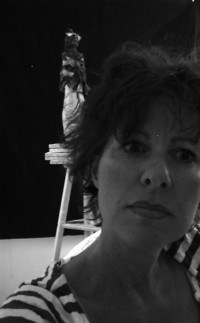 Lilian Wessels (Harderwijk, 1958) grew up in an artistic environment. At a young age she often was in the studio of her grandfather. He was a captain in the merchant navy. After his retirement, he made drawings and scale models of sailing ships and he also painted portraits of ships. 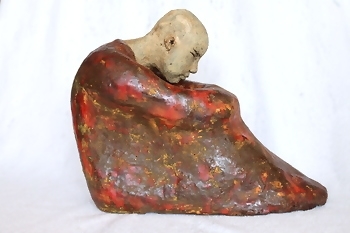 In 1978 Lilian followed a study Art & Design/ sculpture at Padworth College in Reading, England. Back in the Netherlands she did a study ‘anatomy for the artist’. She moved from Amsterdam to Zoetermeer and was apprenticed to artist Willemijn van der Spiegel, who specializes in making impregnated textile objects. 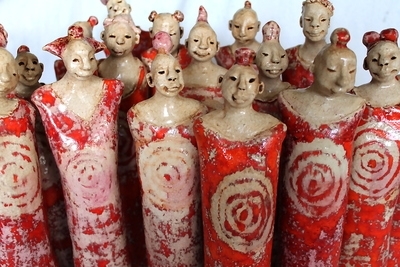 Lilian then gave a number of years lessons in ceramics (hand shapes) and impregnated textile objects. In 2001 she joined the Center for Arts & Culture in Zoetermeer. There she took lessons in portrait drawing, modeling, sculpting, ceramics, pottery and photography. 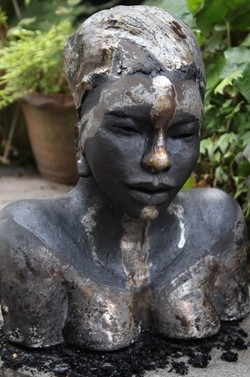 She is a member of the artists collective Terra Art Projects in Zoetermeer. She experiences a growing interest and appreciation for her work at home and abroad. Her work is still developing. New forms of inspiration, new techniques and the use of other materials provide conditions for a journey whose end is not in sight. A list of exhibits can be found on her website.